UNC Club Hockey’s 2016-2017 accomplishments stood out on and off the ice. The team was ranked in the top five most the year and won over 22 games. 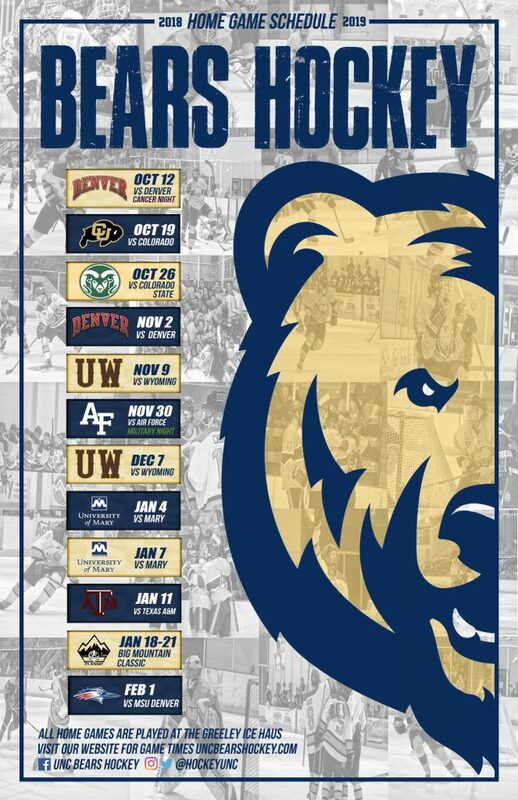 They were the first ever Big Mountain Hockey Conference Champions and hosted not only the Mile High Classic but also the Regional Tournament. The team started “Bear for a Day” where youth in the community receive a game jersey and pre-game on ice & locker-room experiences. UNC Hockey also promoted awareness, raised money & honored those in our community by hosting Military and Breast Cancer Nights at the Ice Haus. Throughout the year UNC Club Hockey was able to give thousands of dollars back to the community. As well as to a fellow club hockey player from another university who became ill during the season. It’s for these reasons and others why it’s no surprise UNC Hockey was named ACHA Division II Community Service Award Winner for 2016-2017. This award is presented for outstanding contributions to the local community and charitable organizations and representation of the ACHA.